Phase one of the Atkins diet plan is also known as the Induction Phase. This phase is the most restrictive, at lasts for at least two weeks. Atkins Diet recipes for phase one or Induction, make it easier to enjoy variety while you lose those first 10 to 15 pounds. This recipe offers spice with a creamy texture that satisfies the taste buds and helps you drop those unwanted pounds. Wash peppers, and cut in half. Strip the seeds and membranes out of the peppers. Be careful not to touch your eyes. If you would like an especially hot pepper, leave a bit of the membrane in, as that is the spiciest part of the pepper. Stuff peppers with cream cheese. Slice bacon in half, and wrap each half pepper with half of a slice of bacon. Secure with a toothpick. Grill for 20 to 30 minutes over medium heat. Serve hot. This hearty recipe is full of flavor and perfect for a family meal. It makes great leftovers, too. If you want the yellow color common to this recipe, add 1/2 tsp. turmeric powder, but it is optional. Heat approximately a tablespoon of olive oil in a large skillet pan. When hot, add onions and fry until golden brown. Add ginger and garlic and fry for a minute or two. Add chicken pieces, tomato, cumin, coriander, paprika and turmeric. Cook until tomato blends nicely. Add some water to just cover chicken. Bring to boil. Let it simmer until chicken becomes tender. This easy recipe is perfect for dinner with a small side salad. Rinse pork chops and dry. Sprinkle with seasonings (both sides). Heat olive oil in oven-proof skillet. Reduce heat and add broth. Remove from heat and place in preheated oven for 30 minutes or until done. 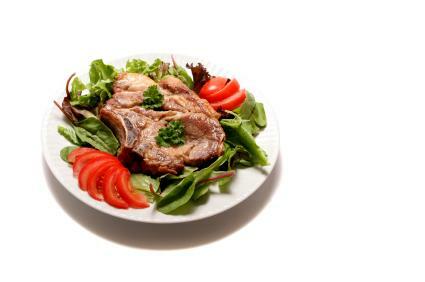 The Atkins Diet offers a variety of mouth watering recipes. Pick up a copy of Dr. Atkins' Quick & Easy New Diet Cookbook: Companion to Dr. Atkins' New Diet Revolution for more Atkins Diet Recipes phase 1 ideas.